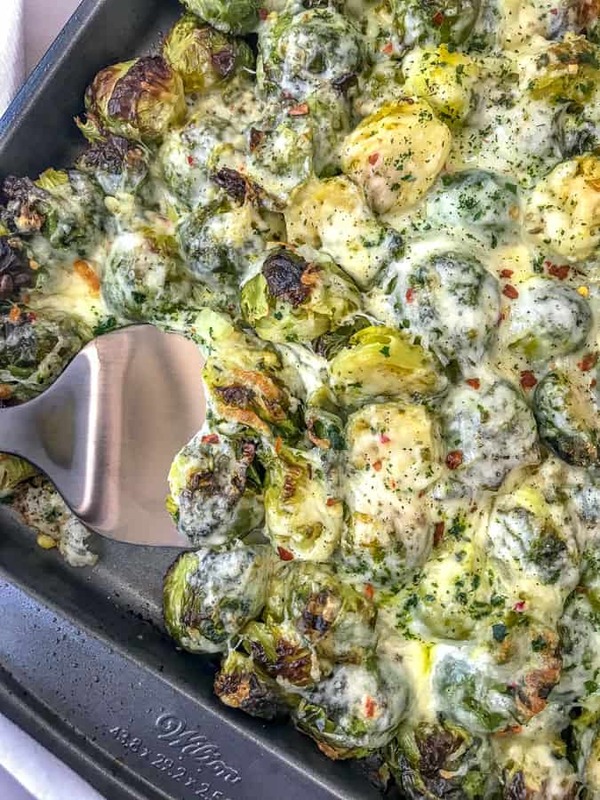 Cheesy Pepper Jack Roasted Brussels Sprouts – a simple, one pan side dish that comes together in 35 minutes. 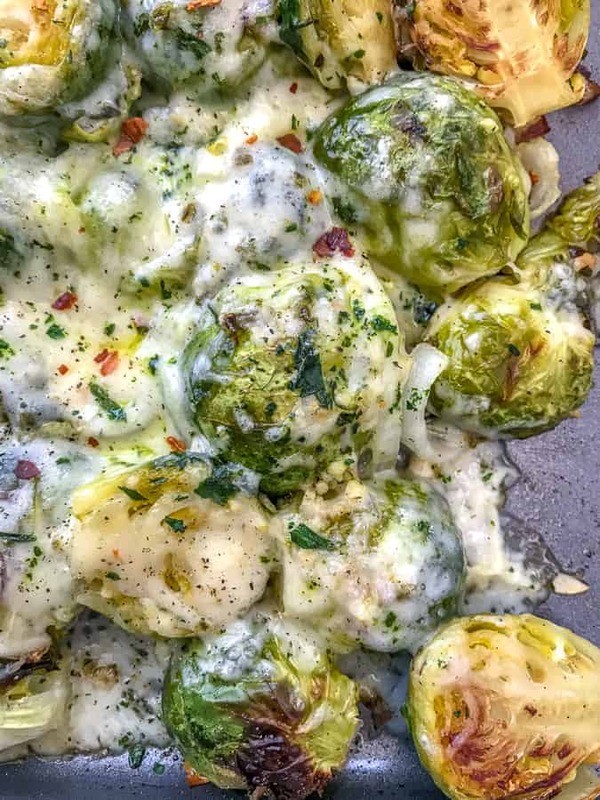 Tender, buttery brussels sprouts are roasted with garlic, onions, freshly grated pepper jack cheese and seasonings on one sheet pan and are guaranteed to be a crowd pleaser at your table tonight! This recipe is easy, low-carb and keto-friendly. 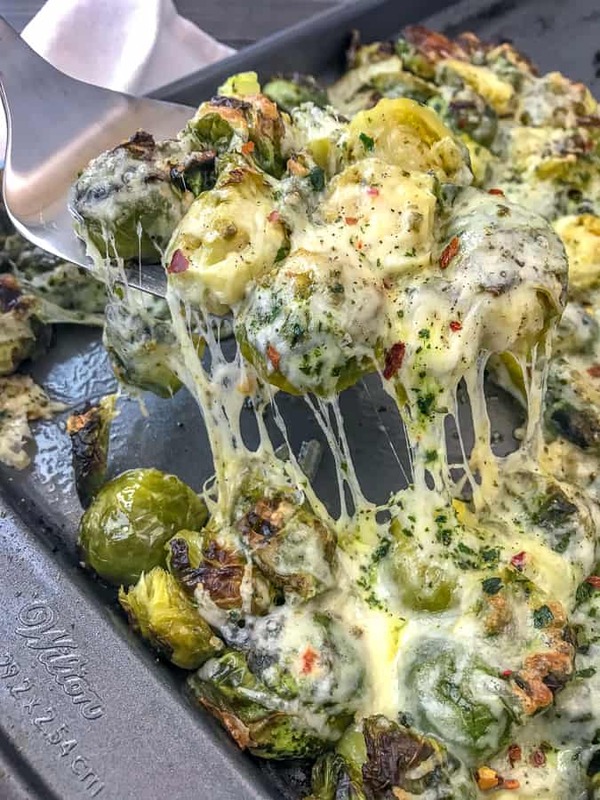 These Cheesy Pepper Jack Roasted Brussels Sprouts are an ideal side dish to any meal and only use a handful of ingredients and one sheet pan! Let’s keep life simple, stress-free, and delicious! 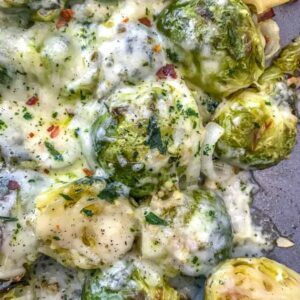 I guarantee that if you didn’t like brussels sprouts before, you’re going to love them once you try this recipe. Cheesy, flavorful goodness straight out of the oven. As a kid, I will admit – I was not a fan of brussels sprouts. Let’s be honest here, what kid is? I stuck to the same vegetables without complaint; broccoli, peas, green beans, and corn. Those, to this day, are the least “offensive” of the vegetables and are a general staple in my kitchen. That all changed the day I made these and my Roasted Balsamic Brussels Sprouts! Brussels are now a staple item in our kitchen! Especially when they are so easy to make! See? A handful of ingredients that I bet you already have in your kitchen! If you take a look at a brussels sprout, you will see a hard stem at the base. Trim that base off. Remove any leaves that appear to be turning yellow or browning. Slice them in half or quarter them. Slicing will depend on how large or small a sprout is. If they are very small, you can leave them whole and if they are very large, I would quarter them. When roasting, you want to make sure the vegetables are approximately the same size in order to guarantee even baking/cooking. Otherwise, you will end up with pieces that are cooking faster, therefore burning on the pan. If some leaves happen to fall off (and they will) while slicing, simply discard or place them overtop of a brussel sprout once its on the pan – like a blanket. If you leave any random leaves on the sheet pan, they will burn and crisp up, possibly setting your smoke detector off. KIDDING! I hope. I have never had this happen. They will simply burn and get crispy, which is not appetizing. Alternatively, you can hold on to the separated leaves and toss them into a salad! 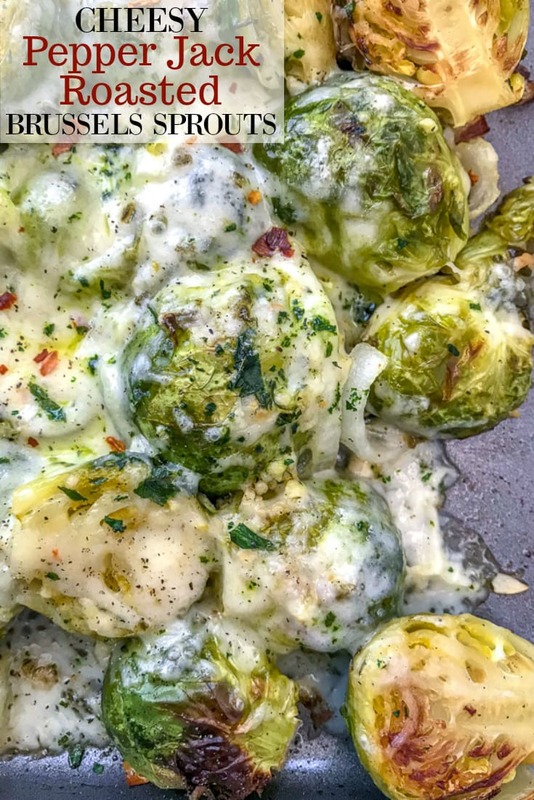 Brussels sprouts may have a bad rep, but if you’re looking to increase your vegetable intake, brussels are the way to go. They are low in calorie and high in fiber, nutrients, and antioxidants. They are also a great source or Omega-3 fatty acids! Preheat oven to 425 degrees F and coat a large nonstick skillet with cooking spray. Trim and slice brussels sprouts. Removing any yellowish or browning leaves. Place sprouts cut-side down onto the prepared baking sheet with onions. In a microwave-safe glass measuring cup, melt butter. Add in olive oil, minced garlic, salt, pepper, and parsley. Stir well. Drizzle butter mixture overtop of all sprouts. Stir gently with a spatula to mix in the butter mixture. Spray the tops with nonstick cooking spray to make sure they are thoroughly coated. Bake for 20, remove and add cheese. Place under the broiler on LOW for 3-4 minutes, or until the cheese is melted and just starting to brown. 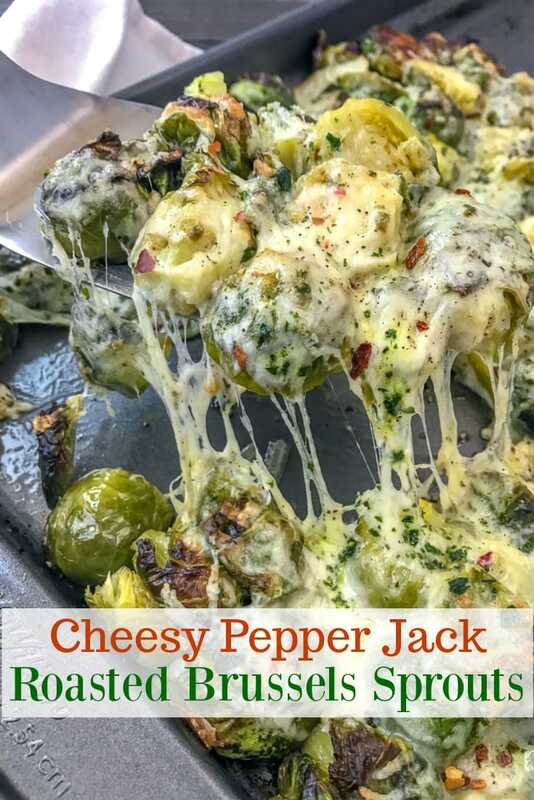 CHEESE: Not a fan of pepper jack? Swap it with mozzarella , provolone or your favorite cheese. Freshly grated melts sooo much better! Use freshly grated! SPROUTS: Be sure to place the sprouts onto the pan cut-side down. This helps to create a crispy, caramelized coating along the cut edge. SUPER delicious! HERBS: If you don’t have parsley, you can sub with basil. SIZE: It is essential to make sure each piece is approximately the same size to ensure even roasting. If some sprouts are very small, leave them uncut and place on the pan. If they are medium-sized, halve them. Larger – quarter them. ADD-INS: Feel free to add in any other vegetables you prefer. These are also great with sliced mushrooms, bacon, and ham! BROILING: The brussels will shrink when they roast. 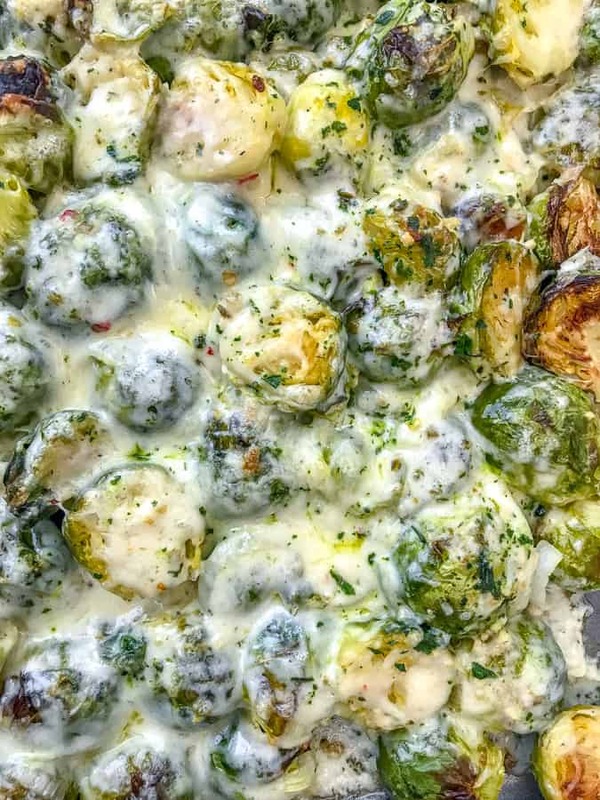 Before adding the cheese, shift the brussels sprouts to one end of the pan in a single, crowded layer. This will help to make sure the cheese covers all of the sprouts and not the pan. MELTING BUTTER: I find it easier to add the butter to a one-cup, microwave-safe glass measuring cup to not only melt the butter, but to add in the oil, garlic, and seasonings. You can melt, mix, and pour very easily from one cup! 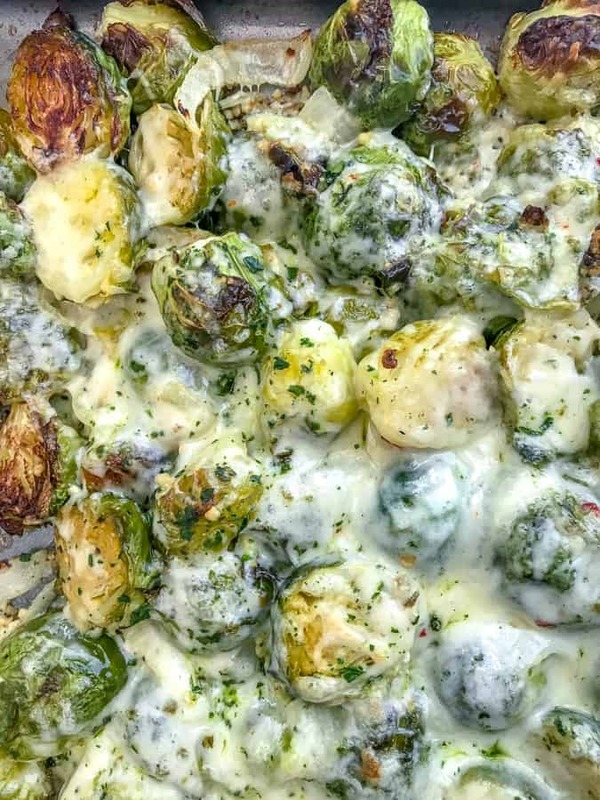 Tender, buttery and caramelized brussels sprouts that are roasted with onions and garlic before being topped with a blend of pepper jack cheese and parsley. Roasted to perfection and all on one sheet pan. Easy to make, easy to clean up! Preheat oven to 425 degrees F. Spray a large (17-inch) baking sheet with nonstick spray. 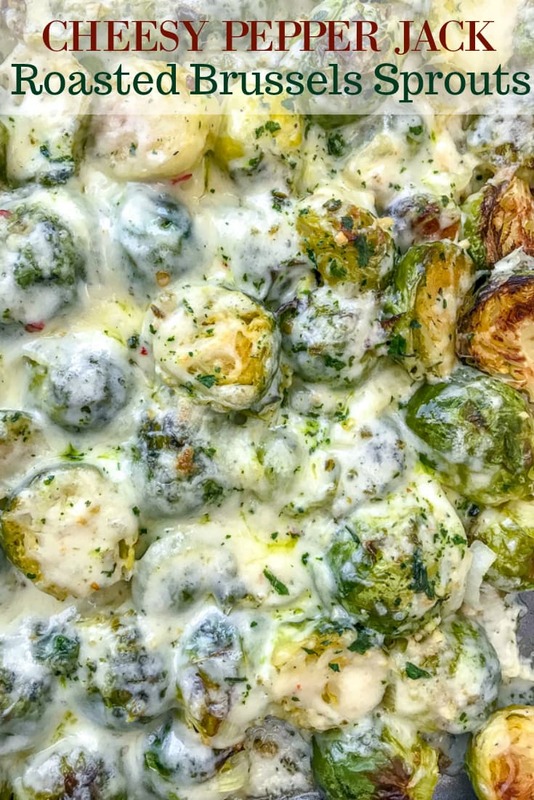 Place the halved brussels sprouts onto the baking sheet, cut-side down. Discard any loose leaves. Top with sliced onions. Melt the butter in a microwave-safe glass measuring cup. Add olive oil, parsley, minced garlic, salt and pepper. Stir well. Drizzle the butter mixture over the brussels sprouts and give the pan a gently stir, making sure to keep the brussels cut-side down. Spray sprouts with nonstick cooking spray - this ensures every bit is coated with oil. Bake 20 minutes. During the last 5 minutes of roasting, grate the pepper jack cheese. Remove the sprouts from the oven. They will have shrunk while roasting, so using a spatula, shift the brussels to one end, creating a single, yet crowded, layer. This will ensure all of the brussels are covered with the cheese and not the pan. Top with cheese and return to the oven under the broiler on LOW for 2-4 minutes, or until the cheese has melted and starting to brown. Remove and garnish with freshly chopped parsley, red pepper flakes, and black pepper. Season with additional salt, if preferred. Serve hot. HERBS: If you don't have parsley, you can sub with basil. SIZE: It is essential to make sure each piece is approximately the same size to ensure even roasting. If some sprouts are very small, leave them uncut and place on the pan. If they are medium-sized, halve them. Larger - quarter them.